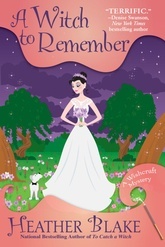 The Enchanted Village always has a touch of magic about it, but the buzz of excitement over the wedding between wish-granting witch Darcy and Police Chief Nick Sawyer is positively electric. But Darcy’s dream wedding is threatened when the Divinitea Cottage, the tea room hosting her bridal luncheon, goes up in flames, revealing the strangled body of the owner, Leyna Noble. Making vows to solve the crime without delaying the nuptials, Darcy focuses on her prime suspect, and number one nemesis, wicked witch Dorothy Hansel Dewitt. But when a psychic vanishes without a trace, Darcy’s investigation shifts to Leyna’s mysteriously bewitching past. Darcy must sort through mystical claims and old grudges to find a killer.